HOSP-ICA-5: Name and describe various fixed equipment and small wares associated with the commercial kitchen and bake shop. HOSP-ICA-8:Examine and preform all aspects of kitchen knife use and classic knife skills. This week is going to be very exciting! Students will continue to obtain knowledge about various types of commercial kitchen equipment and small wares. Students will learn how to identify the parts of a standard chef's knife. Students will venture into the culinary lab to begin learning classic knife cuts i.e. 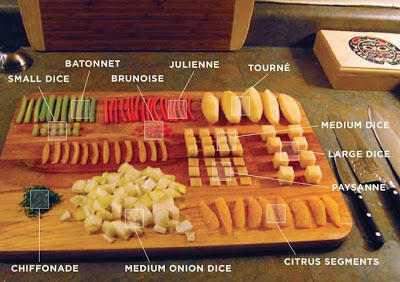 large dice, medium dice, small dice, brunoise, fine brunoise, batonette, chiffonade and julienne.